T-Square Mod provides a set of precision creative building tools for Forge from a former dev of VoxelSniper. T-Square seeks to avoid all text commands for a fully mouse-driven experience. My main goal is to make a version of VoxelSniper that can be used in Vivecraft, but you don't need Vivecraft to use T-Square. While T-Square will never be able to reproduce 100% of the VoxelSniper experience, because of the interface differences, my mod should be very familiar to anyone who used the original Bukkit plugin. For those unfamiliar with VoxelSniper, here is a simple analogy: If Minecraft is paint, T-Square is photoshop. Rather than placing blocks one at a time, you can place hundreds or thousands of blocks using a wide variety of tools or "brushes." 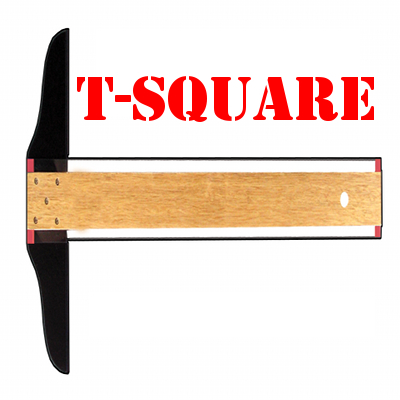 Cubes, sphere, lines, triangles, and more are possible with T-Square. Terraforming is a breeze with tools such as blob, blend, and smooth. @Modpack Developers: You may include my mod in your non-commercial pack with attribution to the CurseForge page. Works great, but It's really laggy whenever I try to use most of the tools. Is there a recommended amount of RAM I should allocate or anything? There's a TON of math that goes on behind most of the tools, especially things like Blob or Smooth, and the number of calculations scales with the cube of the stack size. That is to say a stack size of 3 looks at 27 blocks but a stack size of 10 looks at 1000 blocks. I recommend keeping your brush size under 25 for most purposes. More RAM can probably help, but a slow CPU or saving your world to an HDD instead of an SSD is gonna cause problems too. There literally was already a 1.12 build out when you posted this. this is probably the closest ive gotten to a mod that implements the paintbrush from the toolbelt bukkit plugin. but my problem is its not the same, is it possible to add a config option that will change the paintbrush mechanics? id like it to left click to select the block i clicked on and right click to paint. ive literally not found a mod or sponge plugin that does this one simple thing. The kind of paintbrush you are describing is totally doable. I don't know that I'll rework the existing paintbrush, because I like the off-hand override. However, I might make a new "Quick Brush" or some such that acts in the way you describe. that would be amazing! im sure you remember the paintbrush from the voxelbox, thats pretty much exactly what i need. also to note that im using the 1.10.2 version, is it possible to get it backported if the brush makes its way in? I just uploaded a 1.12.2 version. It should be available for download shortly. Hey, I know this mod is very new and you are most likely sick of looking at it for the time being. That is perfectly understandable. However, I do think that an update to 1.11 pt or 1.11.2 is needed as it is designed to be used in an almost-vanilla type format and these sorts of mods are often left behind because they don't keep up with vanilla versions. 1.11.2 beta has been released. Would it be possible to make this mod somehow survival compatible? I am working on a pack where "final" progression level is ability to shape world on a grander scale that it is usually possible in survival in a reasonable amount of time, think voxelsniper/worldedit in survival with a cost attached to it so no creative mode spawning blocks out of nowhere/for free. Is it something that you see being possible in future? T-Square is focused on creative play. While it is theoretically possible to pull blocks from the player's inventory, there's just no way you can carry enough blocks to do big edits with T-Square. At best, Steve can only carry 2304 blocks in vanilla. If you tried to place all of them at once, that's only a cube about 13 blocks on a side. The Cube by Center can do a cube 127 blocks on a side, which is about the size of a small mountain. I could theoretically make everything cost EMC, but not every mod provides EMC values for its blocks...sometimes intentionally. I could just put a flat RF cost or something, but with a Big Reactor or whatever, you're not really worried about it anyway. In short: by the time you have enough materials/energy to actually use T-Square, you already are basically at infinite resources. So, it really doesn't make sense to make them survival at all. For small scale stuff, I highly recommend the builder wands provided by mods like Extra Utilities. Those are very survival friendly. That being said, I am not making crafting recipes for the items. I could easily see someone being smart with HQM only giving you one tool at a time as quest rewards. Many tools aren't very useful when you've only got one of them; cubes and spheres aren't super useful until you've got a stack of 5 or 6 of them, for example. Would you consider a whitelist, a palette of predefined blocks that can be deleted/created when terraforming and sculpting? That could make a tool usable for mass scale building without going full creative.